Dr. Steve Abeler’s father, Dr. Jim Abeler, Sr., became a chiropractor after World War II and opened an office in Anoka in 1951. Dr. Abeler’s brother, Dr. Jim Abeler, in 1980 joined his father in practice as well, making chiropractic an Abeler family tradition. Dr. Abeler’s father kept the whole family quite healthy in with chiropractic care with his children missing very little school. 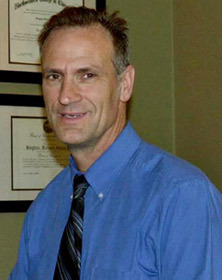 Dr. Abeler grew up in the Anoka area and is happy to have been a lifelong resident. His father strongly influenced Dr. Abeler’s decision to become a chiropractor. “I saw him helping people all the time and wanted to serve others too.” Dr. Abeler attended Northwestern Health Sciences University and graduated in 1984. When Dr. Abeler is not at the office, he enjoys maintaining his older Anoka 1887 home, gardening, exercising and boating. He has five adult children and tries to keep up with their busy lives. Dr. Abeler is very involved with his local church and volunteers his time both at church and in the community, and has a caring heart for the older generations of our area. Our welcoming staff is ready to determine how to help you meet your health goals. Contact us today to get started.